a move that would undoubtedly make him a player in the division again. The WBC Heavyweight Title was on the line, and the pieces were in place for the prevailing fighter to take on the winner of the upcoming Wladimir Klitschko vs. Chris Byrd match up to bring some sense of sanity to this crazy division. Instead, this fight turned out to contradict all expectations. While many thought this would turn out to be a snoozer, it had many exciting moments and will garner a reasonably high demand for a rematch. 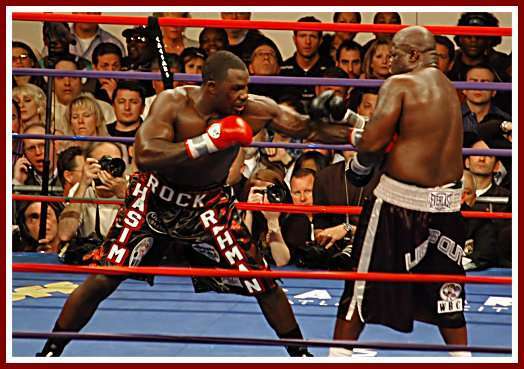 Many favored Toney going into the fight, but most fans left Atlantic City's Boardwalk Hall in disbelief that the ringside judges scored this bout a draw, saying it was obvious that Rahman was the winner. The disappointment didn't stop there. 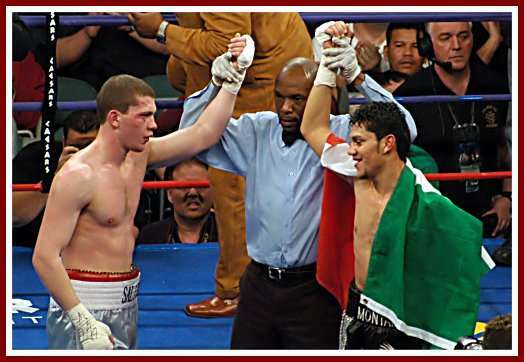 In the co-main event, Christmas came early for undefeated Junior Welterweight prospect Dmitriy Salita as he somehow earned a draw in his fight against Ramon Montano. The Mexican slugger floored Salita twice in the opening round, and had his opponent is serious trouble in other stages of the bout. 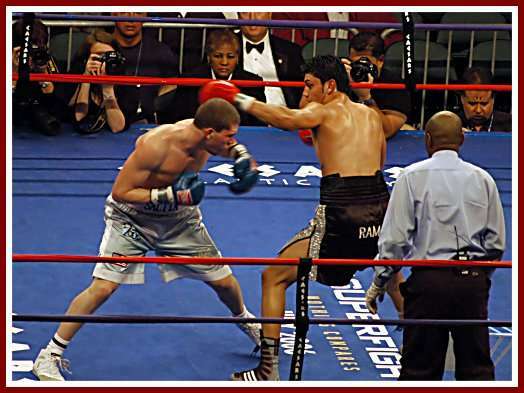 To Salita's credit, he weathered the early storm and managed to make it an enjoyable fight but he should thank his Star of David that he did not receive the first major blemish on his professional record. In other action, Wildwood NJ native Chucky Mussachio once again packed in the fans and bumped his record up to a perfect 6 - 0 in a hard fought rumble against Philly's Edward Hemphill. 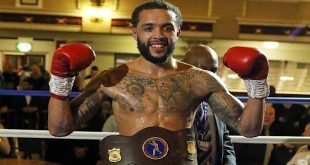 Three is the magic number for Reading PA's Travis Kaufman as made quick work of his opponent to earn his third knockout in three professional tries. After many months of selling wolf tickets, the time finally came for Baltimore's Hasim Rahman and Detroit native James "Lights Out" Toney to step into the ring. Rahman, who is known for packing on the pounds for a fight, showed up in the best shape of his professional career at a jacked up 238 lbs. 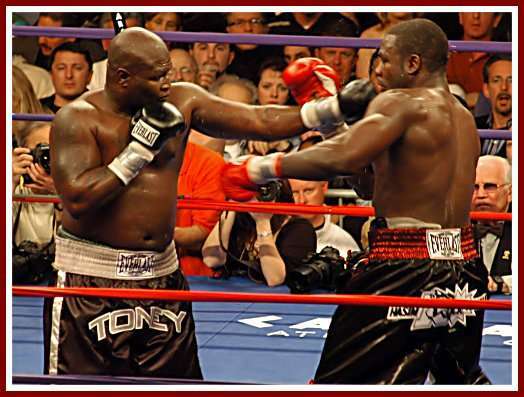 Toney, who is also known for bringing the blub, tipped the scaled at 237 lbs and looked like a mess. 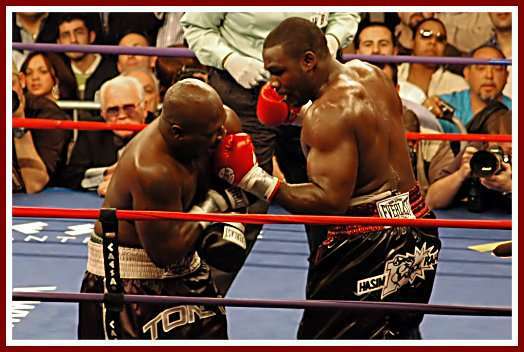 That bring said, Toney also brought his world class hand speed and a chin that Klitschko would kill for. Rahman showed off a sharp left jab, and a methodical approach. Here is how the fight went down. Round 1 - Toney works the left jab early; Rahman follows suit and beings to establish a left jab of his own. Toney shows impressive hand speed as he lands the left - right combo. Rahman hangs in there and bangs away at the body. Rahman ends the round scoring two left jabs and a right at the end of the round. Round 2 - Rahman looks to bring the punishment and Toney responds countering everything coming his way. The fight goes to the ropes and the crowd erupts as both fighters work inside until the final bell sounds. Round 3 - Rahman charges again, Toney takes the shots and counters away again. Toney throws and lands a couple of big looping overhand rights to Rahman's head though they seem to have little effect. Rahman concentrates mostly on the body with the left jab throughout the round. Toney is scoring with his left as well. Another exciting brawl breaks out along the ropes. Round 4 - Rahman fires, Toney fires back which is the theme of this round. The pace wasn't as fast as the previous rounds. Toney tries to steal the round with a late flurry but gets caught by a Rahman right as the round ends. Round 5 - Both fighters start out trading jabs. Toney looks to be loosing some steam but is still willing to fight. Rahman works the left jab to the head and body. Toney fires back towards the end but nothing seems to land clearly. Round 6 - The fighters start out again mixing it up. Rahman again to the body, Toney again firing off counter punches. The middle of the round slows down but both fighters pick it up in the final minute with a spirited exchange in the corner. Round 7 - The fighters are neck to neck grinding it out in the middle. Toney successfully lands the uppercut but it is apparent that he can not hurt Rahman. Toney fires away and Rahman stands his ground. Rahman lands a sharp right upstairs but Toney fires right back with a left that finds the mark. Once again, both fighters are in close fighting it out until the bell sounds. Round 8 - Rahman comes out of the gate landing a right but that's all Toney will allow for the first minute and a half as James fires off lefts and rights which hit the spot. 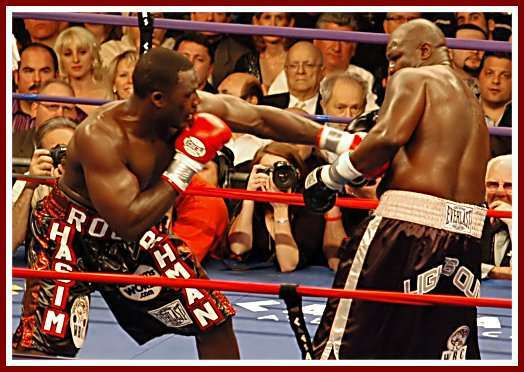 The fight goes into the corner where, surprise, Rahman leads and Toney counters. Round 9 - Round is slow, Toney tries to bring the action to the ropes where he is most successful but Rahman doesn't bite. Fighters mix it up in the middle on the ring and Rahman lands a nice right - left combo. 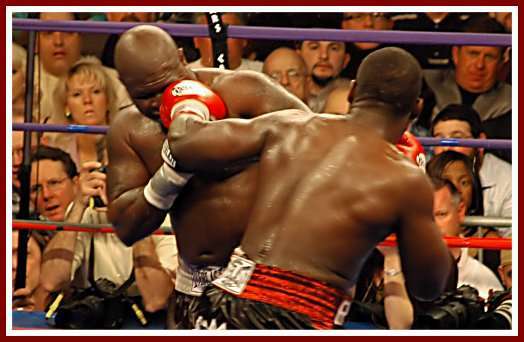 Round 10 - A slow round that Toney grinds out with his left hand work on the inside. 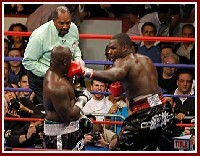 Round 12 - Toney comes out and tries to end it with one big right but misses. Rahman goes back to the inside and stays there for most of the round. Toney fires back and another battle ensues in the final minute. Rahman hangs inside and punches away at his wide target. 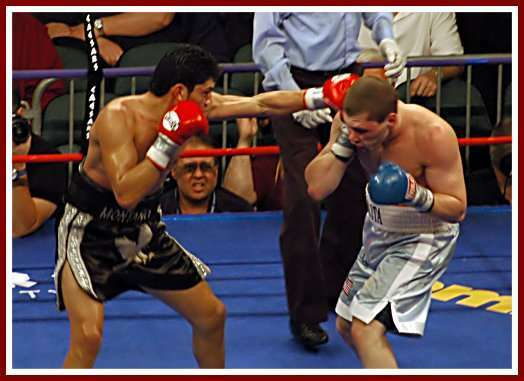 Round 1 - This fight started off fast as Montano floors the undefeated Salita half way through the first round with a straight right that landed square on the jaw. Salita rose to his feet and Montano hit pay dirt once again, courtesy of another straight right to the jaw putting Salita's back on the canvas. Salita barely beats the ten count only you receive more of a beating. Montano keeps the heat on high and lands a left hook which came ending the match early but to Salitos credit, he stayed on his feet and survived the round. Round 2 - Montano tries to pick up where he left off and lands another big right that buckles the Brooklyn brawlers' knees. Dmitriy wisely begins to use the left jab which keeps Montano at bay. Montano continues to apply the pressure but Salito somehow is able to box his way out of the round. Round 3 - Once again, Montano starts the round connected with a hard straight right hand which buckles Salita. 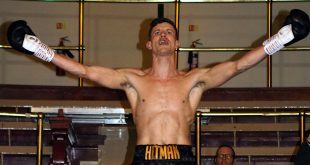 Salita wants to go toe to toe and slugs it out in the middle of the ring. The action dies down and both fighters use the strategy of throwing two punch combos and backing out. Round 4 - In a very boring round, Dmitriy makes good use of his left jab. Round 5 - The round starts off slow until Montano picks up the pace lands two straight right hands to the head. Montano stays on the attack but Salito boxes his way through the middle portion of the round. Montano lands a late flurry to end the round. Round 6 - Montano tries to apply the pressure but it is thwarted by Salito's new strategy of doubling up the punches. Salito does an excellent job of avoiding his charging opponent and avoiding the brawl. Round 7 - Not much action in the 7th as both fighters tap away with the jab. 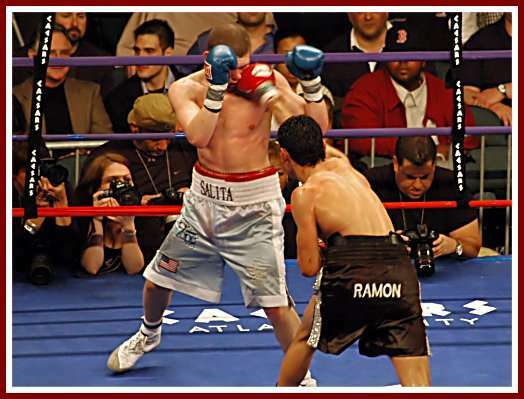 Salito scores more with the double left jab. Round 8 - Both fighters come out looking to win the final round big. A nice inside battle happens inside and both men exchange at many points all across the ring. "The Professor" Chucky Mussachio instructed Edward Hemphill that when you fight in your opponents backyard, you better bring you're A game to get the win. 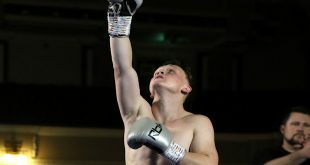 While Hemphill was a game challenger, Mussachio showed a solid jab, chin and some pop in his right hand to earn a majority four round decision. 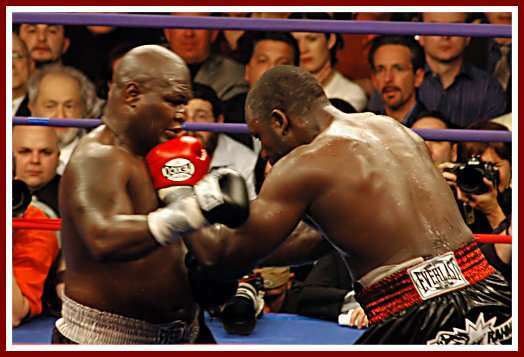 Thompson and Wheeler threw heavyweight bombs at each other for four rounds until Thompson changed up and landed a shot to Wheelers right kidney area, putting the Philadelphian down to a knee and leaving him unable to continue. 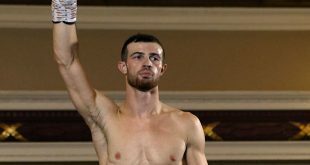 Travis Kaufman continued his knockout streak by landing a big haymaker to the head of his opponent in the first round of their scheduled four round bout. Suszannah Warner put the first blemish on the record of Noriko Korya in a scrappy four round rumble. Warner was the aggressor though Koriya shows a showed defense technique.